Today’s flower is a Gazania – a lovely and bright perennial from the Asteraceae family which comes from South Africa. The flowers are often seen in shades of yellow but white, creams and dark reds are possibilities too. Gazania will bring a ray of sunshine to your garden. 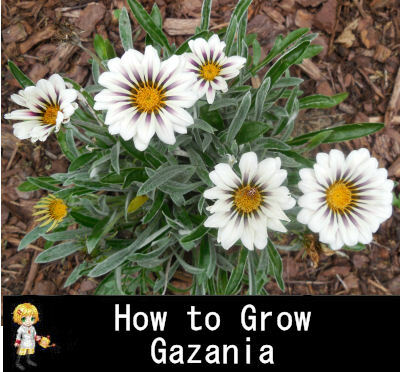 Gazania is a tender clumping perennial that will grow to about 12″ in height and just about as wide. It has blooms that look almost like daisies. The common name for it is Treasure Flower. I have Gazania growing in a full sun part of my test garden and it is blooming beautifully right now. Warmth: According to the US Department of Agriculture, Gazanias need warmth and are perennial in zones 8b-11. In colder zones it is grown as an annual. It will bounce back after a light frost but prefers it when it is warm. Sunlight: They grow best with at least 6- 8 hours of sunlight. Soil: Well drained soil. They do not like wet feet. Let the soil dry out at least partially before watering again. Once established, it is fairly drought tolerant. Bloom time: Summer to late fall. Use in garden: great in rock gardens or planters. Butterflies love the flowers. Care: Pinch off dead flowers to extend the bloom time. Pruning: If grown as a perennial, prune the plant each year, in late winter or early spring, beginning in the second season, by cutting the foliage back to 2 or 3 inches above the ground with pruning shears. This will refresh the plant and encourage new growth. ← Where do you keep your vegetables when the season ends? These will sometimes self sow in Georgia. I love Treasure Flowers. Neat! I’m in NC. Hope to see some come back next year!